Rio Salado was officially designated as an Arizona Supportive Campus by the Arizona Department of Veterans Services this last December. The award recognizes Rio Salado’s commitment to providing support to its student veterans, faculty and staff by instituting veterans’ programs, resources and awareness throughout the college. To learn more about Rio Salado's Veteran services, please visit us on the web. 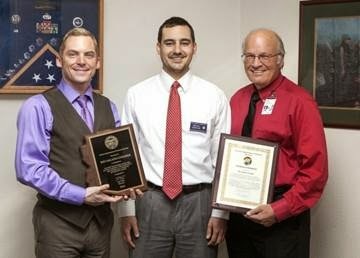 Pictured left to right: Dean Kevin Bilder, Bryan Durham from the Arizona Dept. of Veterans Services, and Associate Dean Mike Pattarozzi.